The PIC32 microcontroller model was choosen January 21st, so we had 1 week to design and PCB layout the board, 1 week to produce the blank PCB, make stencils, prepare software demo code and one week to setup the assembly line and run the PCBs for asssembly. Today we got first batch of the assembled boards. For these who do not remember this board is using the new PIC32MZ2048EFH064 with 2MB of Flash, 512KB RAM, Ethernet, CAN and fast 18Msps 12bit ADC! all this in compact credit card size format. At Embedded World in Nurenberg 23-25 of February we will give away these boards but only to registered/approved developers. If you want to take your board at the show please send us e-mail and write what projects you have done, so we can confirm that your board is reserved. Important: we will not give away boards to Embedded world visitors who have no reservation/approval from us in advance. You can’t visit Embedded World? 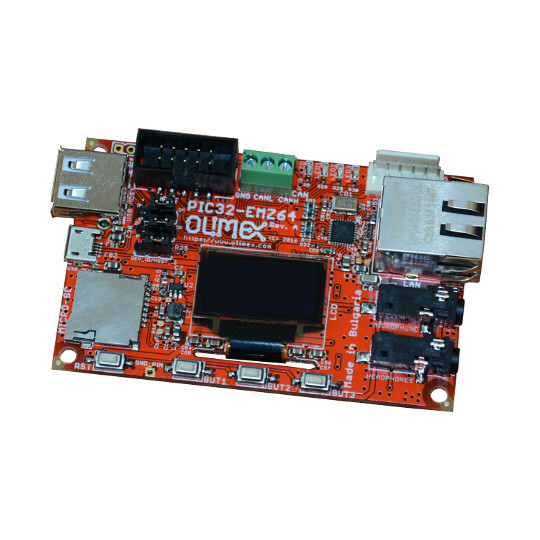 Do not worry you still have chance to receive free board – just send us e-mail and tell us what projects you have done with PIC or Olimex boards before. We can decide to send you by post one of these free of charge. Previous New OSHW iCE40 FPGA evaluation board project Next Friday Free Board Quiz – the prize is ESP8266-EVB and the question is: what is the size of 0603 capacitor? No option to just buy the board? sure, it will be possible to buy. @progmetalbg, price will be >= 25 EUR. The original estimate was for 25EUR, but with lower class PIC processor with less RAM, flash and no CAN, so I guess this board coud easily reach 30-ish EUR. That’s nice, but in errata it says that MCU has serious issues with primary oscillator and Microchip recommends external clock or internal oscillator as clock. This board is using crystal oscillator, could you make it work? Looks great, I wanted to ask will initially be the best/supported way to program this board and access its wide range of hardware features ? I also think this would be a great platform for Olimex to have LiteBSD support on (so please send some to Serge over at retrobsd.org 😉 ) Thanks and good luck at EW ! The board is very interesting but it has not a I/O connector apart from UEXT. There are a lot of PIC32 pins not connected, why do not bring them outside of the board via a pin header connector ? Sorry, I did’nt recognized it is a H064 version of PIC32 ! How about a bigger PIC32 to have some I/Os ?